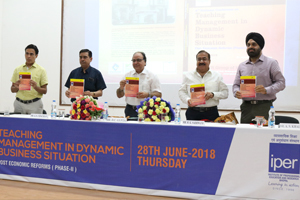 The Second National conference on “Teaching Management in Dynamic Business Situation – Post-Economic Reforms (Phase II)” was organized and hosted by the IPER Bhopal on Thursday, 28 June 2018. The conference was held in the gracious presence of honorable Chief Guests – Vice Chancellor of Barkatullah University Dr. DC Gupta, and Dr. GS Chauhan, Deputy Secretary UGC CRO, who inaugurated the seminar along with Mr. R.K. Sadhwani, Vice President – Chaitanya Shiksha Samiti, Mr. Narendra Rawtani, Treasurer – Chaitanya Shiksha Samiti and Dr. Amarjeet Singh Khalsa Group Director IPER. The inaugural session of the conference was followed by the lamp lighting and worship of idol Saraswati. The list of dignitaries who were present on the occasion included Dr. Mukesh Chansoriya, Dr. Ashutosh Verma, Dr. Parag Dubey, Dr. Sulakshana Tiwari, S.K. Khatik, Dr. Sameer Sinha, Dr. Pawan Mishr, Dr. Vivek Khare, Dr. Sunita Anand, Dr. P.K. Chopra, Dr. K.N. Tripathi, Dr. Swami, Dr. Vivek Sharma Director CRIM and several other researchers, scholars, academicians and department heads of various Institutions under BU Bhopal. More than 160 research papers have been published in this year’s research journal released on the occasion. The conference focused on the need of enhancing the teaching pedagogy after the economic reforms (D & GST) in India which is being constant since ages- Dr Khalsa said. He added that the education system should enforce the recent economic reformation that has changed the business scenario. These changes should be espoused by the academicians, faculties and in their way of teaching. This will help students to face new economic challenges to contribute their best to the wealth maximization of the stakeholders and thus the Nation. In a day-long programme, noted dignitaries from academics across the state were present to manifest their research papers and shared their views on adapting the management methodology in the changing economic and business situation. Several topics were explored under the presence of session chairs and experts who participated and interacted, exchanged opinions, views, discuss issues, problems and also analyzed various pedagogies. Topics discussed were Emerging Trends in Marketing, Current Financial Scenarios, Logistic and Supply Chain Management, E-Marketing, Social Media Marketing, People management, Emerging Area in Human Resources, Leadership, Team Management, General Management, Strategic Management, Financial Management Practices and the Human Resources Management. Felicitations were in order and were presided by the chief guests with highlighting the stats. Mr Narendra Rawtani stressed the importance of the research paper and journal in the education field. He added that “Research should be actionable which can be put into the use of enhancing the society. It should not only subject to published in the journal but should facilitate in such a manner that can benefit the society”. Research papers have to focus on the future scenario that can be estimated with the present day variations in the business sector. The conference concluded with the vote of thanks and souvenir to guests and chief guests and with the sense of embrace changes of the fast-changing pace of the world.